Spruce is a pine wood from the evergreen family of trees. It is a somewhat yellow wood found in almost all the building materials you see. If you open your attic door and look in, you will see all spruce (pine) holding your house together. Most of the fences built with new houses are made with spruce. Left untreated, a spruce fence will last just 5 to 8 years. Properly treated, it will last between 8 and 12 years. Still, spruce fences never look as good or last as long as cedar fences. When a builder chooses a spruce fence, it is typically only intended to last long enough to sell the home to someone else. Cedar is also a type of pine - one that is known for its fragrance and durability. It tends toward an orange color and is straighter and cleaner than spruce. Cedar comes in basically three grades: clear, grade 1, and grade 2. Clear cedar has no knots, looks perfect and looks like luxury furniture. At Duck Fence & Deck, we use grade 1 cedar on 99% of our cedar fences and clear cedar on the others. We do not use grade 2 cedar. Left untreated, a cedar fence will last 15 to 20 years. Properly treated and maintained, it will last for 20 to 25 years. 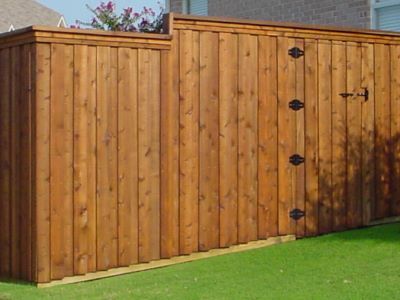 Grade 1 cedar is by far the most popular fence board being used today. Pressure-treated wood is pressure treated to keep it from rotting, and you can spot pressure-treated wood by its characteristic green color. The process is great for lumber that is 2 inches by 6 inches or larger. We use the process for our kickboard along the bottom of a fence and for framing decks. Duck Fence & Deck does not use pressure-treated wood for fence planks for one simple reason: When pressure-treated wood is sliced thinly enough for a fence plank, it tends to warp terribly.